The Sales Tracking feature allows you to track sales coming from people who have entered your sweepstakes or contest. If a user who enters your promotion goes on to make a purchase from the same device or browser that they entered the promotion from, the pixel will track and report that sale. The first step is to install the sales tracking pixel. Simply hover the campaign in your ViralSweep dashboard, click Analytics, then click Sales Tracking. We will roll out pre-made pixels for more shopping carts soon. Simply copy and paste the standard pixel onto the page that a user will see after they make a purchase on your site. To set a static value for the purchase (where the purchase value will always be the same), simply change value=0 in the pixel to something like value=2500. This represents a $25.00 purchase. To set a dynamic value for the purchase (where the purchase value will always be different based on what the user has in their cart), you will need to have your developer determine the value using your own server-side language. Simply change the 0 in ?value=0 to the proper amount to report the purchase value. Your developer will need to determine the value of the purchase before the page loads and then inject that value into the pixel. 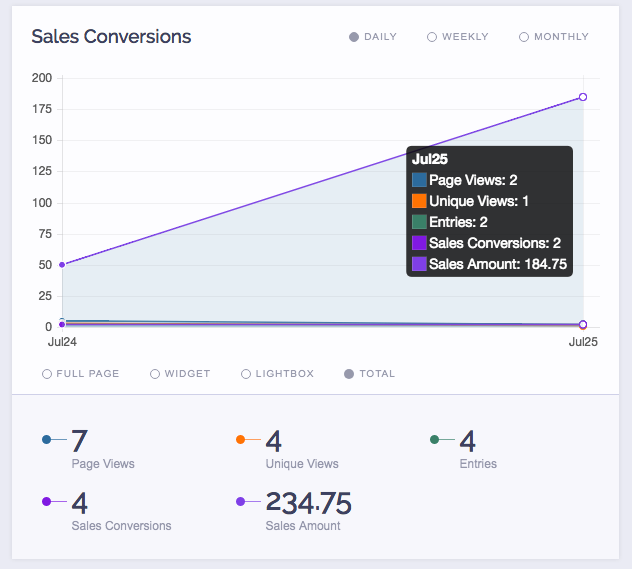 1) Inside of ViralSweep, go to Analytics on your campaign, then click Sales Tracking. Click on Shopify to get your pixel. 2) From your Shopify admin, click Settings, then click Checkout. Now, whenever someone enters your promotion and then goes on to make a purchase through your store, we will report the total price of the users purchase, which will include any shipping fees. 1) Inside of ViralSweep, go to Analytics on your campaign, then click Sales Tracking. Click on BigCommerce to get your pixel. 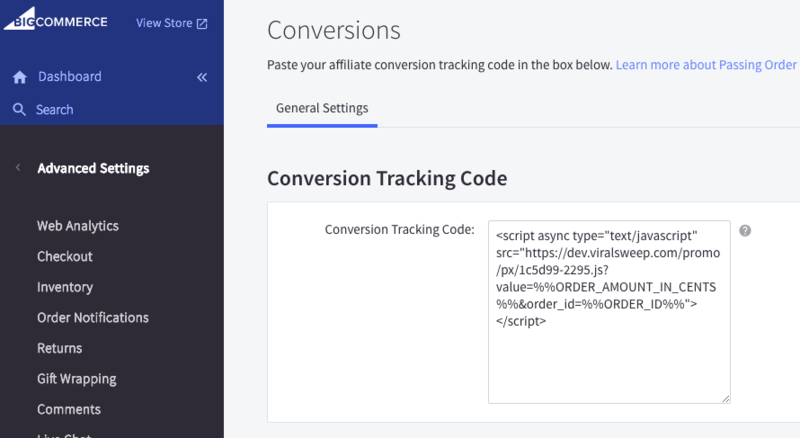 2) From your BigCommerce dashboard, click Advanced Settings, then click Affiliate Conversion Tracking. 3) In the Conversion Tracking Code section, paste your pixel into the box. NOTE: A WARNING WILL APPEAR THAT THE CODE IS INVALID. IGNORE THIS AND CLICK OK.
To see all data on purchases from your campaign, simply go to Analytics > Sales Tracking. We provide you with charts, as well as a table breakdown of all the data. In addition, you can export the data from the table to see the email addresses and purchase amounts. If ViralSweep is reporting a sale, but you do not have any sales in your system, then you have added the pixel to the wrong page. This can happen if you add the pixel to a page that the user sees before they've actually completed their entire purchase. Be sure to move the pixel to a page that the user will see only after their order is submitted. If all your sales are being recorded as the same amount, this is because you are using our standard pixel and have put in a static value. If you need to report a dynamic value (where every purchase will be a different amount based on what the user has in their cart), then you need to have your developer follow the directions on this page for adding dynamic values. If you have sales and think they should be reporting in Viralsweep, the most common reason as to why they won't show up is because the person either did not enter your promotion (we will only track sales from an entry, not a pageview), or the person made their purchase on a different device than the one they entered your promotion from. Still having trouble with our Sales Tracking feature? Simply click the support or live chat icon to get in touch with us.